I've written previously about erasing all the data from your hard drive, in my article Completely Erase a Hard Drive. So you may know that simply issuing the DELETE and/or FORMAT commands really just hide (rather than irretrievably erase) the data. That's why there are special programs written for that purpose. What you probably didn't know is that those programs work very well for traditional magnetic hard drives, but not well at all for flash drives or SSD hard drives. Even worse, researchers at the Non-Volatile Memory Lab at UC San Diego have discovered that many solid-state drive vendors have not properly implemented the “sanitizing” features of SSD standards, leaving random clusters of data still on a supposedly “cleaned” drive. Even physically damaging an SSD drive may not be enough. In a paper entitled, Destroying Flash Memory-Based Storage Devices, the researchers calculate how finely one must grind up a flash-based storage device to ensure that its contents can’t be retrieved by spies of three different levels of sophistication. It’s not enough to just break a flash drive in half or drill a few holes in it. At the least, you must make sure the biggest piece is no more than 7.5mm (about ¼-inch) in its longest dimension. Frustrating a hypothetical worst-case spy who has unlimited resources and time requires grinding the storage device up into nanoparticles. The USCD team's findings are important because there are lots of USB flash drives bearing sensitive data, and because SSD hard drives are the growing future of mass storage. Flash drives are small and cheap; they get lost or are casually discarded. SSDs are currently expensive but their prices are falling rapidly; eventually, they may surpass magnetic media as the most popular mass storage medium. There are standard commands programmed into drive controllers for sanitizing whole flash drives or specific files on a drive. Every drive maker incorporates these commands into its products in a proprietary program. The UCSD team tested the sanitizing effectiveness of a dozen vendors’ flash drives, with widely varying results. The “Erase Unit” command to overwrite the entire drive was fully effective in only four of the dozen SSDs tested. One model reported that the drive had been completely sanitized but, in fact, did absolutely nothing! The drive partition could still be mounted and all of the data remained intact. Sanitizing individual files was also erratically effective, or ineffective. Between 4 and 75 per cent of each “sanitized” file’s contents remained readable on SSDs. On USB flash drives, between 0.57 and 84.9 per cent of a “sanitized” file’s contents remained readable. Part of the blame for these dismaying results clearly lies with vendors who write buggy drive controller software. But the international standard on which all such software is based is another culprit; it was written with magnetic media in mind, not electronic memory. 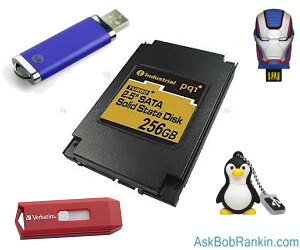 SSDs and flash drives use a different, more complicated scheme to store data. If you're like me, you may have a drawerful of USB flash drives dating back ten or more years, and most of them are just too small to be useful nowadays. With this information in mind, it's wise to think twice about donating, selling or even casually disposing of any that could be storing sensitive data. The same applies to a laptop with an SSD hard drive. Unless you're 100% certain that your personal data can be permanently erase, it would be better to install a new SSD drive in the laptop, and do a fresh install of the operating system. Of course, if your solid-state drive contains nothing of great value, putting it inside a paper bag and giving it a few good whacks with a hammer will probably be sufficient. A determined person would have to spend lots of time and money to recover the data. Encrypting the drive before inflicting physical damage would make recovery much more difficult. If you've got personal, confidential or proprietary business data on the drive, don't rely on tools written for magnetic drives. A commercial hard drive shredding service would be my recommendation. Most recent comments on "Erasing a Hard Drive? Not so Fast..."
Another pretty good way of destroying a hard drive is to drill holes through it, ...lots of holes, big holes if possible. I would just burn them in my wood stove or on the terrace stove! Any drive, storage devise, can be made safe with a propane torch. One minute burn should do the trick. Another way to obliterate old data on a USB stick or SS drive might be to first to "delete" all files, and then fill up the drive with multiple copies of some large but non-sensitive file. Keep re-copying files to the drive until zero bytes are available. I _think_ that would work. What about using CCleaner's Overwrite program? Is that useful enough to erase data for all but the most sophisticated retrieval attempts? In reference to destroying data, would incineration of any kind destroy the drive enough to make it useless? How about putting the offending SSD in the afore mentioned paper bag, and after applying an amount of charcoal lighter fluid to it you set it on fire? Of course you may want to do this in your driveway or charcoal grill rather than your kitchen. You may then place it in a large amount of used cat litter and send it merrily on it's way to the dump. Merely a suggestion, but I'll bet it works. About the article "erasing a hard drive , not so fast". I wonder if the best way to make a flash drive or SSD totally unrecoverable would be to toss it into a really hot fire or even run a gas torch flame over it. Sounds pretty drastic I know, but surely that would be a guaranteed way to do it - - - wouldn't it Bob? EDITOR'S NOTE: I would not recommend putting any electronics in the microwave, oven, fireplace or indoor wood stove. You might be releasing toxic materials that you don't want you be breathing. If you erase then fill the drive with country music, rap or Justin Beiber and appropriately label the drive ... nobody would ever care to even look at what else might be on it. Just curious, what kind of super sensitive data is on these things that you want to completely destroy them? Why not just keep using them until they quit functioning? In the case of smaller flash drives, just put them in the garbage (don't tell the environmental folk, though) to be buried. Even SSDs can be taken apart and disposed of in this way. Who will actually be looking through the garbage to see if there's a memory device in it? Maybe it will be found by some archeologist in a million years, but so what? By then, no one will even know you existed. Also, someone would probably have to do a lot of research just to see what the thing is. Unless one is completely neurotic about someone trying to resurrect their "secret" data and you know that your household trash goes to the incinerator, just put it in the garbage and let it be taken away. Hello Mr. Rankin and my fellow Rankinites! Hook up a regular external hard drive to your solid-state computer and when downloading material just send it DIRECTLY to your external hard drive where it will go directly into your TrueCrypt vault to be Securely and Safely stored! I think this is SO Neat where the material never touches any of the Solid State drives. Bob, thanks for the answer, though environmental issues often take back-seat to paranoia. In general I was just wondering if a microwave would work to scramble the data. Though we all have to remember that we all live in a world in trouble from pollution already, and some of the chemicals used ARE poisonous to people. **ALSO TO ALL OTHERS WHO WANT TO OVER-WRITE**: depending on how paranoid you are (or really do have enemies that want you that badly) overwriting a drive multiple times still leaves a magnetic signature under the data that occupied that space. With programs and machines in the 10's - 100's of thousands of dollars, the stronger magnetic signatures can be 'filtered' out, and the data underneath can be read - it's simple but very expensive. CCleaner would not work, it just marks the address 'unoccupied' even if something is living there. And if something is living there, it can be found without any trouble, it's more for the maintenance of your computer than really "destroying" data. Though I do wonder about PrivZer© working with 35 write-overs, though they do say that the DOD 3 pass method is good enough. If you have someone who you think has the special machines and programs AND TRAINING to read very faint magnetic signatures, I think you have FAR more serious problems to worry about than someone finding an 'erased' disk and reading what's on it. I use Mafia Disk Doctor© on all mag. disk drives, Cals .308, .223, .270 or .30-06 or the perennial favorite .22LR all work just about as well as any gauge shotgun. But have not really thought a lot about flash or SSD's yet. I think John Henry and his 9 pound hammer would solve the problem as Bob pointed out. And I also agree that a lot of the chemicals used on disks are poisonous when vaporized, and our planet's atmosphere is not the best place to store your deleted data. That's NOT what they mean when they talk about "The Cloud". I use DBAN (Darik's Boot And Nuke) to wipe any drive I feel a need to, especially if I am going to do a fresh install of Windows. The program writes zeros to all sectors to "erase" the drive and essentially makes all other data unreadable. Why not put your drive in a re-sealable bag and fill it with water for a couple of days. How is this for a (tongue in cheek) solution? Hire a programmer to record a lot of p**no pictures on the drive to fill it up and then require the unwary user to enter his name on the drive to decrypt it so that the p**n is visible. His name is now on the hard drive. He feazrs that his boss will find out and to protect himself, he will apply the hammer treatment for you. Can you tell me whether or not a high powered electrical magnet will do a clean wipe of internal hard drives SD Cards And external hard drives.